My body positivism does not hinge on the idea that all bodies are perfect as they are, because for some of us, this isn’t true to our experience. Body positivism has been like an old friend that I could lean on in difficult moments. It was there when a doctor labeled me “overweight” for the first time, it was there when my disordered eating crept back in and the calorie-counting began, and it was there when I learned that you can have stretch marks on the back of your legs and the panic about all these changes set in. But—you knew there was a “but” coming, right?—I can’t say that I have always felt included in this movement, you know? Sometimes I wonder who this movement is really speaking to. As a transgender person, some of the language used in this movement can be a little…off-putting. But contrary to the affirmations that litter my Tumblr feed, it’s not about hating myself, and it’s not even about hating this body—it’s a perfectly good body and it’s served me well through thick and thin. It’s about hating what my body has come to symbolize. It’s the mixed messages and the misgendering that come with having a “feminine” body but a masculine gender identity. It’s about how invisible my body makes me feel—the way it tricks others into seeing me as something I’m not. Which, yikes, after being told “Never change! You’re perfect just the way you are!” by some well-meaning Instagram photos, it makes me feel like I’m doing this whole “body positive” thing wrong—even though hormone therapy and surgery are necessary for my psychological well-being. It crushes the gender binary—acknowledging that we aren’t all men and women, and that some of us, like me, are non-binary. People of all genders (and the bodies that they occupy) deserve to be visible, supported, represented, and celebrated. And no matter our gender identity, we are all coming up against a fatphobic, diet-obsessed culture—so I’m making room for everyone to navigate this difficult struggle in their own way. My body positivism does not hinge on the idea that all bodies are perfect as they are, because for some of us, this isn’t true to our experience. But all bodies are worthy—meaning we should treat them with love and care, whatever that care looks like so long as it’s good for us. But sometimes reclaiming requires change. Sometimes it means taking back our bodies from dysphoria, and making the choices that we need to for our health—health that we dictate on our own terms. Sometimes we must transition toward the bodies that we need in order to be well. That’s absolutely OK. Sometimes modifying our bodies can be our greatest act of self-love. Most of all, my body positivism leaves nobody behind. My body positivism is still evolving. It is self-critical, changing, and growing to encompass each and every person. Fat folks, disabled folks, people of color, transgender people, and every intersection in-between—there is a place for you in this movement. 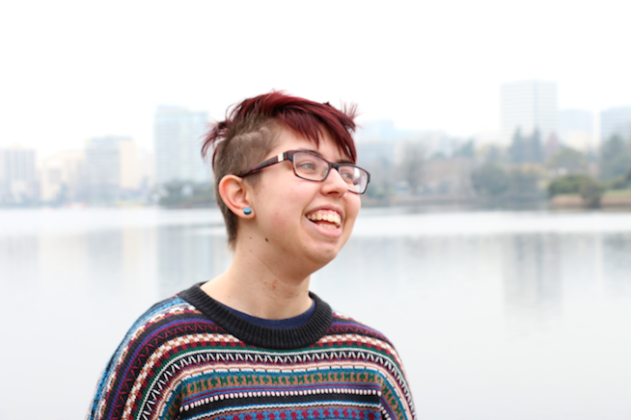 Sam Dylan Finch is a transgender writer and queer activist based in the San Francisco Bay Area. He currently works as a Feature Writer and Social Media Associate at Everyday Feminism, and manages a magical blog called Let’s Queer Things Up!. He can’t stop talking about queer politics, body image, mental health, and pop culture. Find him on Twitter and Facebook so you can be best friends forever.